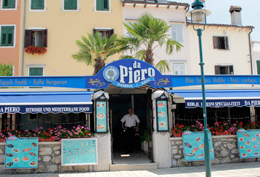 Da Piero is a high quality restaurant of rich tradition, with Mediterranean cuisine and Istrian specialties, delicious grill and pizzas prepared in the italian manner. The spacious terrace is overlooking the attractive walkway in the Old Town. 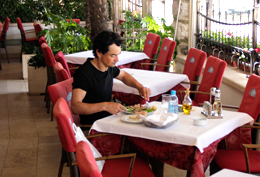 The interior decorated with charm continues to unique Amfora, the famous restaurant of the same owner, which has been popular for decades due to the attractive food offer and the charmy central position by the sea. 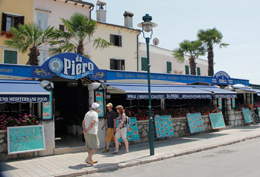 Daily wide range of the Mediterranean and Istrian brunches, meals and dinners with extremely favourable prices is appealing to every tourist busy with sightseeing the centre of Rovinj or the Church of St. Euphemia, to people working in the area, or to romantic couples who want to enjoy the top Istrian delicacies after an evening walk in the Old Town. Carefully selected and high quality Istrian and Croatian wines of the famous wine producers are also in the offer: Kozlović, Degrassi, Zigante, Krauthaker, Zlatni plavac, Dingač, Postup, Iločki traminac, Zeleni silvanac, and the traditional alcoholic beverage rakija is also in the offer Istarska grapa, Istarska biska, Medovača, Vilijamovka, Šibenska lozovača.